Looking for fun step by step videos to learn Adobe Illustrator? Each of the tutorials are slow and easy to follow for brand new users. Each tutorial typically covers a building, coloring and shading method to demonstrate an entire workflow from start to finish. Each of our tutorials comes with and overview of the steps, anchor point guides, color palettes, and step by step instructions. Everything is provided through our resource folder for you to follow along. I am a big believer in repetition, especially to get all of the bugs out while learning the program. We have a variety of different tutorials that get more challenging as your skill sets and confidence grows with the completion of each tutorial. Each of our tutorials comes with and anchor point guide to show the points and handles to follow along at home. The guides make the tutorial very user friendly to gain mastery of the pen tool with a 2 step approach to inking using your mouse. We build each tutorial point by point using our Anchor Point guides so we can gain master of the pen, anchor, and direct selection tools. If you can’t see the contact form above please remove ad or pop up blockers from your browser to see the form. Feel free to add back on the blocker and security after you get your resources. There are 3 emails total in our campaign. The first is a confirmation. Once you click confirm the Link Email is automatically sent to the email you provided. Check your (promotions or spam folder) for the direct link to our resource folder. The last email is our Adobe Support Ticket in case you need any assistance or want to say hello. In the upper right hand corner of our folder webpage you will see a direct download button. I also highly recommend saving the resource Dropbox folder webpage as a bookmark so you have access to current and future materials. Bookmarking the Dropbox folder will make it easy to access all of the future tutorial resources as soon they roll out. This will prevent you from having to dig back through your email inbox for the link. It will also prevent any frustration if you delete the original email. Please note that re-subscribing does not send a new or duplicate email. Let me know that you are going through the tutorials! My favorite part of the day is going through the comments you leave and being as much help as possible as you are working through the resources and tutorials. Open your brush menu from the floating panels. If you don’t see the Brush icon, Go under Window- Select Brushes. On the bottom- left hand corner of your Brush Menu you will see Open Brush Library icon. Click it and Select Other Library. In each tutorial we will mention what Brush Library File we are using. Simply Click on the File and Click Open. The Brush Library will pop up and be ready for use. If you are watching an older video use the Cartoon Brushes Library rather than installing them or creating New Art Brushes. On a lot of the older videos we mention a How to Install your Cartoon Brushes Video and File. You will see the file in the resource folder. This is if you are looking to create new art brushes for a different file size other than 5″ x 5″. Every tutorial can use the updated Brush Libraries for ease of use and to save time. We will be duplicating the same process as above, but we will be adding them to the brush panel and then saving them as a library. You can open a new blank document if you feel more comfortable. You don’t wan’t extra brushes when saving. Open a Brush Library same as the above video. Select the top and bottom brush while holding down shift. Click Add to Brushes or drag over. All your brushes should have loaded in the Brush Panel. Click Menu. Scroll down to Save as Library. You are looking to save in the default Adobe location. All of your saved brush libraries will be in User Defaults in the Brush Library Menu. This file is at the bottom of the Cartoon Brushes Folder. This is a great place to start with your brushes. Please note that this is ONLY for those who wish to change their artboard size or want to take the time to create their own brushes. The newer brush libraries will work on all of the older video tutorials. Open the Brush File and paste it into the file you are working on. Scale the brushes to match the size of the thickest part. This will keep brushes close to a 1pt ratio and will prevent having to bump the stroke up each time. Use the direct selection tool to edit the anchor points and handles. You can also draw out a segment and modify the path with the width tool. Create a New Art Brush. I would select scale proportionately. The directional arrow is only important on tapered brushes. Save Art Brush. When you are all done installing all your new art brushes, you can Save as Library from the Brush Menu. Open your swatch panel. If you don’t see the Swatch icon, Go under Window- Select Swatches. On the bottom- left hand corner of your Swatch Window you will see Open Swatch Library icon. Click it and Select Other Library. In each tutorial we will mention what Swatch Library File we are using or if we are using Spot Colors. Simply Click on the ASE File and Click Open. The Swatch Library will pop up and be ready for use. Click on the folder next to move the pop up swatches into your swatches. This will be important when using Gradients. On some of the older videos we use spot color using the eyedropper tool. First File – Place your Color Swatches. Double Check your layer is unlocked. Use the Eyedropper to select and move the colors to your swatches. Create a New Color Group if you are looking to reuse or save the colors. Make sure you are following the tutorials and creating a new 5″x 5″ artboard. One of the mistakes beginners make is opening the resource folder and double clicking or opening the anchor point guide. We will be PLACING the image into the NEW document we just created. In your newly created file select File -scroll down to Place. Locate your downloaded resource folder. Please note that you will have needed to download a local copy during the previous step. Locate the APG you are using and click Place. Some APG’s will already be formatted for a 5″x5″ artboard. Some Might need to be scaled using your selection tool. Hold Shift and drag from the corners until the image fills the space. In your Align Panel, have Align to Artboard Selected. You can see it in the Control Panel or in your floating Panels. (Window – Align) Click CENTER vertically and horizontally. In your Layers Panel have the Placed image on its own layer. This is always the first step so you shouldn’t have any other elements on this layer. In your Layers Menu – scroll down to select Template. This will Lock Out the layer and give it some transparency. Create a NEW layer above the Template layer to start adding shapes or strokes. Under View – Turn on Smart Guides. To modify Smart Guides to make them more user friendly and not the most annoying things ever. Go to Preferences – Smart Guides. Turn Off: Measurement Labels, Alignment Guides, and Spacing Guides. You can also adjust the color so there aren’t hot pink lines flashing everywhere. In your Preferences- Selection and Anchor Display you can adjust the size of your handles and anchors. My recommendation is to have them larger than the default so your mouse has a bigger target to hit. I highly recommend having Illustrator on your computer screen and have a second viewing device on a tablet or phone. Most phone screens are big enough to see the videos. This will make life so much better than constantly toggling back and forth on your computer between YouTube and Illustrator. If you are struggling with any of the tutorials please do not hesitate to ask in the comments section of the video you are watching. Please don’t let the frustration build, throw your mouse across the room, or curse at your cat. I am pretty consistent about checking multiple times a day to troubleshoot any issues for beginners. As soon as you are slightly stuck or want more clarification you should be asking a question through the support email or YouTube Comments. Adobe Illustrator CC Tutorial using shapes along with shape builder, pathfinder, and offset paths. 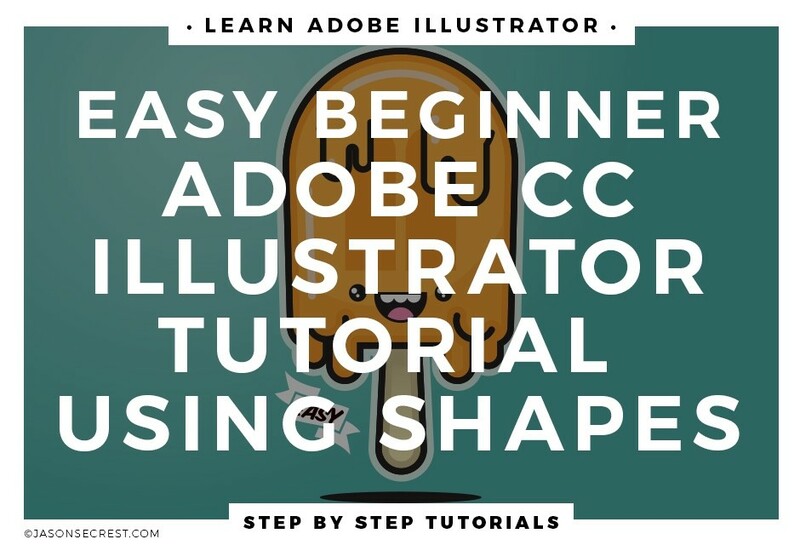 In this easy beginner Adobe Illustrator CC shapes tutorial we will be going through a simple process of building and coloring using shapes. In this easy to follow tutorial we will be going through our resource anchor point guide to build our character and practice using shapes, round corners, shape builder, and the align panel. Shapes are an easy an effective way of building in Illustrator. Align ellipse and rectangles shapes with our resource anchor point guide. Use the align panel to align to selection and artboard to make symmetrical designs. One of the coolest features to roll out in recent years. Select the corners you want to round and drag in using your white arrow. If you are using older versions of Ai this will be and stylize effect-round corners. Shape builder will be a new favorite, especially if you are struggling with pathfinder. Drag through the shapes you want to combine into a new shape and hold alt-option to subtract shapes. 2. Things to pay attention to as you are using the Align Panel is how often we are ground objects together. This will prevent them from collapsing. Every time you click align make sure to take an extra second to look at align to selection or artboard. Usually align to artboard is selected and your shapes fly across the artboard. 3. Easy pathfinder explanation. Copy the base color and paste is front. This is the step everyone forgets. Build a new circle shape that is bigger and covers the top of the base color. You are looking only at the bottom shape. Select circle and duplicate base. Minus front. 4. Select the shapes you want to merge together or subtract. Use Control Y to see if you paths are touching. This is good to zoom in and really look at your paths. If ou get any stray point use the (- ) or delete anchor tool to get rid of them.